Trees can be a beautiful and elegant addition to your garden but they can also be high maintenance. As they mature they require increasing attention to keep them looking their very best and Chain Reaction Yorkshire Ltd know how time consuming this can be. 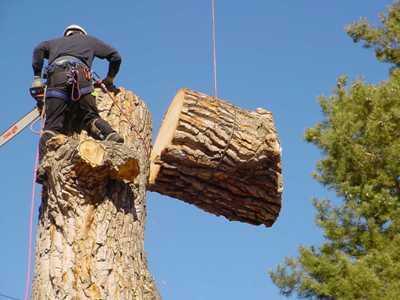 This involves the removal of a tree or trees in small sections in a controlled environment. We take extra care and use safety equipment to ensure that surrounding trees and building are unharmed and undamaged in the removal. This is the selective removal of lower branches in order to provide clearance and safety of passing pedestrians, passing vehicles and nearby buildings. Crown lifting increases the distance between the base of the tree and the branches and should ideally be carried out before the tree reaches maturity. This involves removing selective branches from the crown of the tree to increase light penetration, air movement and create a weight reduction. Any weak and crossing branches are also removed to help improve the look and growth of the tree while retaining the natural shape. Crown thinning is most commonly used on broadleaf trees. This reduces the height and spread of a tree. We take care to ensure that not only the height but also the width of the trees are reduced in a crown reduction. Felling is the complete removal of a tree down to ground level, this involves the lowering of branches and timber so that surrounding structures or plants are not damaged. The stump is left close to the ground and can then be removed fully. This is the process of beautifying a tree. Keeping the branches and leaves under control and making sure the trees looks perfect all year round. We do a lot with trees with the exception of tree reports, so contact us for more information on how to manage your tree.